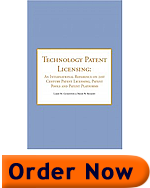 Chapter 7 is a continuation of the description of the 3G Patent Platform, describing specific bodies within the aggregated licensing administrator. The structure, roles, functions, and governance of each body are explained. A comparison is made between two different royalty models – a high royalty model without aggregated licensing, and a low royalty model with aggregated licensing. These models are not merely theoretical, because in industries with fragmented ownership of essential IP, royalty rates can run as high as 30% or more for companies that do not have their IP to cross-trade. To outline the status for the practical realization of the Platform (as of early 2004). To Continue to Chapter 8 –Click Here.